KastKing Sharky 2 Reel Review – 2017 - Great Value? The KastKing Sharky II’s recent introduction to the family of KastKing reels has made a splash in the fishing reel industry. However it also takes a splash. 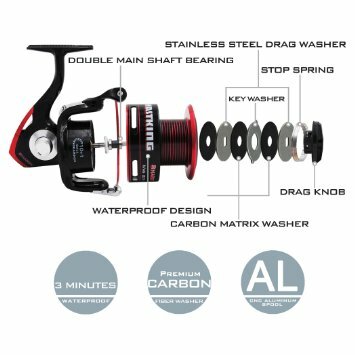 This improved edition of KastKing’s original Sharky reel boasts a number of enhanced qualities and it’s also waterproof. Fishing reels are certainly made to be around water, but any angler knows that water, (especially saltwater), inside your reel will ruin the internal components. The Sharky II offers protection from full immersion in water for up to 3 minutes. Though the Sharky II may not be as lightweight as the Pfleuger Patriarch XT, it does put out 6 models compared to only two of the Patriarch. As we get into other features of the Sharky II, things just keep looking better. The culmination of all that the Sharky II can offer a fisherman won’t let you down when you see the price. We think that’s the best part. As mentioned, the Sharky II comes in 6 different models. 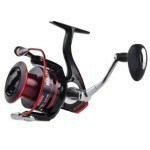 The creators of the Sharky II over at Eposeidon, (the founding company) have done well by offering a high value reel in such a wide range of models. At the lightest end you’re going from a reel that weighs 7.05 ounces and can be spooled with 165 yards of 6 lb monofilament line. Moving up to the heaviest model you get a weight of 16.52 oz, and a spool that can hold 160 yards of 30 lb mono line. That’s a huge difference in reel size. Fill in the picture with all the models in between, and the Sharky II covers a lot of fishing ground. Another highlight of the Sharky 2 is its patented triple disc carbon fiber drag system. One thing they’ve done here is increase the surface area of the carbon discs that actually touch each other when the drag is engaged. This results in much smoother and more reliable release of line from the reel. We’re also impressed with it’s application of 10 + 1 superior grade shielded stainless steel bearings. These bearings are saltwater approved, and combined with water tight seals make the Sharky II an excellent choice for saltwater needs. • Waterproof for up to 3 Minutes – Feel free to take an unexpected spill. Even complete submersion won’t hurt this reel as long as it’s not left under too long. • Patented Drag System – The Sharky II drag systems offer some of the highest resistance we’ve seen in spinning reels across all models. It tops out at 41.5 pounds of maximum drag on the Sharky II 6000. • Precision Mesh Brass Gears – Upgraded to 30% stronger than the original Sharky. • CNC Precision Machined Aluminum Spool – Made 10% lighter than the original version, yet also stronger. • Power Launch Lip – A special part of the spool design provides a longer distance cast. • Stainless Steel Main Shaft – Adds more precision and quality to its performance. The Sharky II is smooth and quiet. The result of all these features makes the Sharky II a stronger, yet lighter reel than previously available through KastKing. The waterproofing is an added bonus, but the real value comes through in its price. The KastKing Sharky 2 offers a better reel than many top name brands at a better price. The Okuma Avenger is a good example of this. Though the Avenger does offer a closed bail free spool feature, it falls short in other areas. The biggest pro of the Sharky II lies in the quality and precision of manufacturing along with its low price. These are the two qualities that make a product have high value, and these reels have plenty of each. The story of how KastKing is able to do this is an interesting one and can be read at KastKing.com. Offering a wide range of models is another pro of the Sharky 2. It makes the reel available to a large audience of fishermen over a wide spectrum of uses. From line shy freshwater trout and bass to large saltwater game fish like yellowtail or dorado, these reels can cover most needs. The waterproof seals used in this reel make it perfect for saltwater use. It would be perfect to use the Sharky II 1500 or 2000 as a light reel for surf casting. It’s Power Launch Lip casting feature makes it even better suited to any casting situation. The Sharky II 6000 would come in handy offshore when casting a surface iron is required to get the fish to bite. Once you’ve got a big game fish hooked, having a drag system that boasts 41.5 pounds of resistance will certainly add to your chances of landing that fish. With the value offered in the Kastking Sharky II, it isn’t easy to come up with drawbacks. The truth is that no reel I’ve ever seen offers everything a fisherman could possibly need, and we see this here as well. For offshore purposes you can’t go any higher than 30 pound monofilament. Although you could definitely add strength by using braided line. Unfortunately these reels don’t come with any kind of a free spool bait running system. Live bait fishing is such a frequently used technique, which could be limiting. Any species that can really pull line could lead to problems as it comes off the spool. With all factors considered, I really can’t say enough about the Kastking Sharky II line of reels. Sharky II is especially suited for casting in most saltwater situations. I also highly recommend using braided line with these reels. The reason being that with such an advanced drag system, it would be a waste to use monofilament that would break before putting the drag to any real test. With all the different choices of reels on today’s market, it’s the value of the KastKing Sharky II that lifts it above other reels in its class. Fishermen will be hard pressed to find a reel that’s as well built as the Sharky II, and that comes anywhere near its low price. Thanks KastKing for making another full value product that leaves us money for the other fun parts of our fishing experience. What factors would help determine the best user choice between the Sharky II’s six different models? Intended prey and its size , line capacity and how much drag force is needed may dictate the reel size.You wouldn’t use the largest reel for small fw fish or the smallest offering for large SW bluefish or stripers. Typically most spinning reel bodies are made out of aluminium or graphite. The aluminium ones are more suitable for fresh water fishing and the graphite ones are great for saltwater fishing. This is because these two materials react differently on the contact of different salt content of water. So, be sure to choose one that suits your fishing environment. I just got mine. Haven’t used it yet. I’m loving the way it feels. As of now, it’s the best reel I own and I haven’t fished it. Every reel has flaws… so far just from out of box condition, I’ve found the crank assembly has some slop in it. This gives it a cheap feeling… I may have found a solution to cleaning this up, take off 0.3mm or so on the pivot screw and add a thin nylon or aluminum washer on the side body (possibly use cooking foil). The slop has a “I may snap something” mental aroma that can’t be avoided until broken in. The bailer is pretty thick, and I feel like they could have used a thin SS wire instead of a meaty red one. The drag screw sits a little crooked when it’s loosened too much. Mounting arm is a bit wobbly; I wish the feet were 2mm wider or have a different concave to let it seat more flush. The auto-bailing is stiff to get it to flip on the reel-in but I don’t use that ever. I always manually pop the bailer down every time. Not an issue for me. The graphics/lettering seem cheaply painted. Not a big deal but I think they could switch to a different method. The anti-reverse is pretty active. There is zero play in that which isn’t common in cheap reels. Smooth as hell all around. I love it. This reel felt wonderful out of the box. BUT… After one time use it never quite felt the same as it did coming out of the box. its a nice looking reel with a pretty light construction. there is a long list of features that KastKing claims this reel is capable of and i just want to say it sort of stretches out the truth OR lets be fair and say that the features listed are most likely a tad bit over exaggerated. One of the more specific features i will focus on is this reel being water proof. My first time using this reel it was ” Splashed” with a bit of saltwater from the ocean. NOT submerged but ”Splashed” once the water hit it. everything i ever wanted in a reel was completely gone. the smoothness ? instantly gone, the action… rough. took it apart, gave it a quick rinse and applied grease on it. still to this day i wish i had just listened to a friend of mine and just gotten the Penn Battle 4000. is it worth buying ? eeeehhhhh the price looked right. but for what you get i will say. not worth it. would i ever buy one again? most likely not. dont waste your money, buy a more reputable branded reel and you’ll be doing yourself a favor the first time. I own 2 Kast King Sharky II’s and a Kast King Speed Demon bait caster and love them. I actually bought them because of the price and figured if they weren’t what I expected, I wasn’t out much money. I fish mainly inshore salt water and have never had an issue with any of them. They perform as well or better than my Shimano Stradics or any of the other models and are now the first reels I reach for. Because of the old saying ” you get what you pay for”, it’s hard to convince anyone that these reels are quality reels and great performers but they are and worth many times their cost. If you want a quality reel at the very best price on the market, you owe it to yourself to try one. You won’t be disappointed.